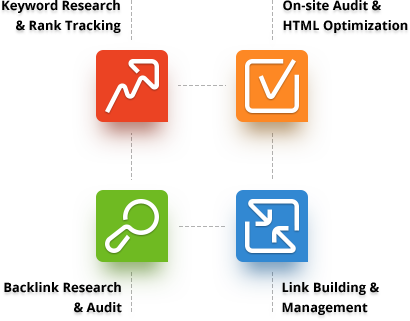 SEO PowerSuite is a compilation of Link Assistant's top four SEO software products: Rank Tracker, WebSite Auditor, SEO SpyGlass and LinkAssistant. This suite of SEO tracking software brings together the best of Link Assistant's SEO tools into one place where they are easy to access and can work together on your complete SEO program. PRO: SEO PowerSuite is strong in keyword research and optimization tools. CON: The software has limited options for exporting data and SEO reports. SEO PowerSuite's keyword suggestion tool gathers data from both Google AdWords and Wordtracker. Both AdWords and Wordtracker are top tools in the industry for finding site-appropriate keywords. The suggestion tool also provides an unlimited number of keywords and keywords phrases. Having a higher amount of keywords to choose from increases the chances of finding keywords that perfectly match the needs of your website. This SEO management software provides additional tools to help you sort through keywords and keyword phrases to find the perfect keywords for you. One such tool provides estimates on the number of visitors a certain keyword will bring to your site if you have the number one ranking on that keyword. This saves you valuable time by skipping the trial and error associated with choosing keywords. You will be able to see which keywords will or will not work before putting them on your site. Building and managing backlinks takes a lot of attention to detail. SEO PowerSuite walks you through the steps of developing an SEO campaign based on competitor research. The SpyGlass tool digs through search engine backlinks to find reliable and relevant links for your site. These features do not go quite as in depth as the very best SEO software tools, but they still provide useful data. The link building software allows you to track an unlimited number of backlinks, so your campaign growth will never be limited. It also extends its estimator tool to the backlinks category and will calculate the potential value of a link before you pursue it. The WebSite Auditor tool allows you to schedule competitor analyses and regularly scan the progress of your competition's website optimization and links. This tool will closely evaluate your top 10 competitors, allowing you to directly compare yourself with them. With this insight, you can fine tune your campaign to gain an advantage in your SEO program. SEO PowerSuite pulls your competition's SEO details from both keyword optimization and link building, and it integrates this information into the suggestions it makes for your SEO strategy. With this approach, SEO PowerSuite makes competitor analysis a part of your total SEO plan, rather than relegating it to a separate section that you would check periodically. While SEO PowerSuite is not as strong as some of the other software packages in reporting, it brings a lot of useful tools to the table. One such tool is the social media tracker which provides information from the most popular social media sites like Facebook, Twitter and Google Plus. What SEO PowerSuite lacks is the ability to export your reports as PDF or other standard files, and you can't schedule automatic reports to be delivered. These omissions mean you won't be able to easily share and analyze data with colleagues, and you'll have to manually generate reports when you want them. Perfect to try SEO PowerSuite's functionality. You can use the software for all SEO activities but won't be able to save your projects with history. Best choice for webmasters and website owners who don't need to operate with huge amounts of data and create client reports. Overall, SEO PowerSuite provides all the tools small business owners need for managing an effective SEO campaign. It has a full offering of keyword optimization tools and link building features. It is lacking in reporting options, which can be detrimental when analyzing data. This software is a good choice for small business owners managing a site.